There’s much to love about the iPhone, but the built-in camera isn’t on that list. Even if you can get past the low resolution and lack of flash, you still have to resign yourself to the fact that you can’t edit any photos you take with the camera—at least, not without the help of some third-party apps. Special Effects: In addition to cropping and other adjustments, Photogene includes the ability to add other effects such as frames, though bubbles, and background options. Add Photogene to the list of helpful image editors from the App Store. Developed by Omer Shoor, this user-friendly app makes cropping, adjusting, and adding fun effects to your photos a breeze. 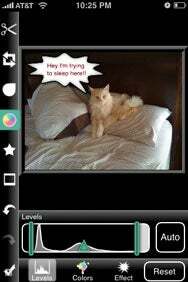 Photogene can edit images in your library as well as ones taken with the built-in camera, so the app works with both the iPhone and the camera-less iPod touch. The app’s Photoshop-like levels slider provides decent control, and the auto-levels feature yields surprisingly good results with little noise. Cropping with Photogene is easy and precise, letting users draw their own crop box or choose from pre-set aspect ratios. And if you’re not happy with your photo’s color or sharpness you can adjust that as well. But Photogene isn’t all business: Besides the ability to add sepia tones, night vision or a creepy heat map effect, the app includes a variety of frames, symbols (including cartoonish thought bubbles) and text/background options. And, thankfully, there’s not a cheesy birthday hat or most-wanted poster option in sight. Photogene could stand to gain a few more effects, but for a basic photo-editing app with some nice extras, it’s well worth the money. Photogene is compatible with any iPhone and iPod touch running the iPhone 2.1 software update.